TruConnect Prepaid MiFi - My Review! 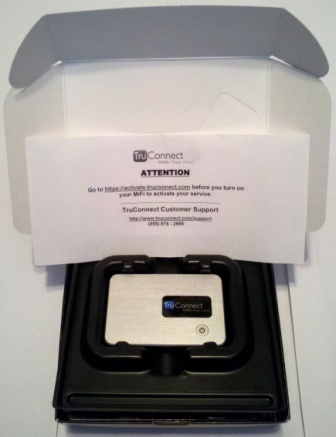 TruConnect prepaid MiFi officially launched with the company debut back on December 1, 2011. What makes TruConnect extremely unique is not their MiFi broadband modem, as it has been in the wireless Internet market for over awhile now. Rather, TruConnect is a truly unique no contract pay as you go broadband company, because it was the first provider to offer simple pay as you go data pricing at $4.99/month and $0.039/MB. At the time of launch they offered only this one plan type, available on both a USB modem and a MiFi Hotspot modem. As a result of its success, TruConnect later rolled out monthly plans with a great variety of price points, as well as smartphone plans, and even a Lifeline free cell phone service plan! Unfortunately, it has since done away with it's pay-as-you-go model, which is very disappointing, as I continue to receive messages from visitors to the site who are still looking for this type of offer. Unfortunately, it tends not to generate sufficient revenue to allow companies to be highly profitable, and doesn't enable sufficient growth to keep investors interested. Upon the company's launch, I contract them regarding testing their service. They were happy to oblige, and sent me a free prepaid MiFi device to test. Along with it, they sent me a prepaid Visa debit card with $20 loaded, so I could test the full user experience. Following my testing (approximately one month), I returned the modem to them. As per usual, please rest assured that I was not paid, nor received any type of incentive to provide a positive review. The review that follows is 100% unbiased (as is the spirit of this entire website), and represents my personal experience and opinions. I hope you find it useful! Also, please note that despite my test being awhile ago now, their service has only expanded and improved. I should also add that TruConnect's President and CEO participated in an executive interview with Prepaid-Wireless-Guide.com, which you can find at Kevin Hamilton TruConnect Mobile Interview. The modem was the same Novatel Wireless MiFi 2200 Intelligent Mobile Hotspot that we were used to seeing on virtually every carrier offering a hotspot (prepaid and postpaid) at the time. 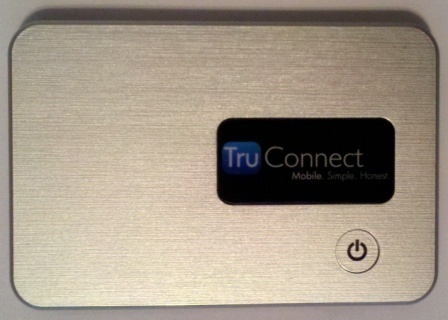 Unlike the Virgin Broadband2Go packaging (that I previously reviewed, and which has since been discontinued), the TruConnect packaging is completely non-branded, and comes straight from Novatel. I'm not going to go into the contents of the box as the hardware essentially mirrors that described in the Virgin Broadband review. I will note that when I opened the box there was a piece of paper with instructions on how to start the activation process, and how to contract TruConnect customer support. It was black and white and printed on cheap photocopied paper. While some may feel that this, coupled with the non-branded box, represents a non-premium or low quality brand, I was happy to see that expenses are being managed closely, allowing customers to benefit from the lowest possible pricing. The activation process was extremely painless, and involved a simple account creation process, followed by a topup (i.e. payment) step. My only gripe/issue with the process came when trying to follow the instructions to login to the MiFi router during the activation process. A password is required and the instructions point you to the Novatel website to download the user manual (which is actually Verizon branded, which is odd because TruConnect runs on the Sprint network). However, the password is nowhere to be found. Having used the 2200 MiFi hotspot numerous times before from other providers, I knew the default password is "admin", so I was able to login. For customers who are new to this type of device, I could see this resulting in a call to their support staff, which would be an easily avoidable step. The URL for the device (http://192.198.1.1) and default password should simply be printed on the piece of paper with the activation instructions to avoid any chance of confusion. At the time of this review, only credit/debit cards were accepted for payment online; there's no means of paying cash without loading cash onto a prepaid debit card. For me this isn't an issue as using a credit card on autopay is my preferred payment method anyway. That said, this could be a potential barrier for some prospective customers. Upon initial payment, the $4.99 monthly fee was charged. The nice thing is that it was prorated, so no matter when you activate the modem during a month, you'll be charged a prorated amount for the days remaining in that month. In other words, the plan is billed monthly on the first of the month, so you don't have to worry about keeping track of a random bill due date. Though, some people will want to select their payment date based on their personal preference or situation (ex. on a pay day). I'm not sure if changing the date is possible, though I don't expect it is based on how the payment model works. That said, for a $4.99 monthly payment, building such flexibility likely would not be a cost effective strategy. Auto pay is a default, and mandatory service whereby your card is charged $10 on the day that your account reaches below a $2 threshold. Personally I like this type of functionality, and have built such programs for prepaid wireless carriers in the past. This way you know for certain that your account will always be available (assuming your card payment doesn't fail). For a product like this where people may only be using it on occasion, this is a particularly helpful, and arguably, necessary feature. Each time a payment was made I received a confirmation email receipt, including an email notification when the payment failed (when my $20 prepaid debit card balance had been depleted). Overall, I found the payment experience to be intuitive, as expected, and generally a smooth experience. As I went into detail on these topics in my Virgin Broadband review, I won't go into them again here. I will, however, note that the speed I experienced seemed slower than I recall experiencing previously with the same device on the same network, while using it in the same locations. I can't help but wonder whether Sprint is throttling speed for it's MVNO partners, or if the data network traffic is being prioritized differently compared to those using the host carrier's own devices. Generally speaking, though, I have seen a deterioration of data speeds on Sprint devices over the past couple of years, at least in areas where I live, work, and play. Suffice it to say that you won't want to use this (or any other 3G device) for streaming videos, or any other real time data intensive activities. For Internet, email, social networking, and general personal or work related activities, you should be fine. In fact, I used a similar device to build over 300 pages of this website! Note, also, that they have since moved to 4G LTE modems, so you wouldn't experience the same thing today. Check email using your Web browser instead of an email client like Outlook. By default, mail clients will download all emails and attachments, which can consume a lot of unnecessary data. Using your Web browser (ex. Gmail, Yahoo, etc.) you can download only the attachments you need at that time. Turn off automatic Windows updates. You can allow it to check for updates, but you won't want to be downloading them on this connection. Speed-wise you'll be ok, however, you'll be paying to update Windows, and who wants to do that! Think about what software you have running in the background on your computer that may be accessing the Internet (ex. cloud music syncing, application updates, etc.). You'll may want to turn those off! Generally speaking, this is good practice anyway; you don't want your computer processor and Internet bandwidth being consumed by all kinds of background processes. Opening a Web browser like Firefox or Chrome with a dozen (or dozens!) of tabs opened will require data to load, as usually cached versions are updated upon a restart. Starting up your browser before connecting to your TruConnect prepaid MiFi can help avoid consuming data. Monitor your usage closely for the first week or so (or 10 or 15 times you connect) to get a feeling for how much data you're using for your typical tasks. This is also true for monthly plans to ensure you purchase the correct bucket of data to meet your needs. Lastly, I have to say that the TruConnect online account activity details were very easy to read, and quite helpful and informative. 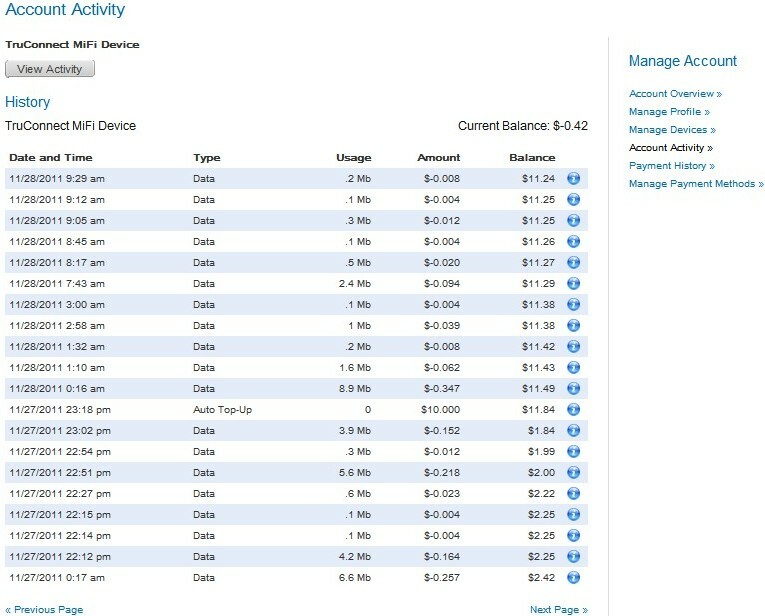 It lists the Date and Time (start and end), the MB of data used during that period, how much it cost, and your total cash balance remaining. Using their online chat support I was told that the site refreshes approximately every 15 minutes, which is very reasonable. It also shows your auto top-up activity. Within your account you can also manage your payment devices (i.e. credit/debit cards), view payment history, etc. Although TruConnect no longer offers this pay-as-you-go plan, they have plans that start at $5/month, which is quite reasonable even for infrequent users. In addition, they've now proven that they are a viable business, and have a number of years of experience. Thus, you can rest assured that they're likely to be around for awhile. From: Northern New Mexico, U.S.A.
"TruConnect offered decent wireless broadband at a low cost in 2012 when I first signed up and got my Novotel Mobilink USB dongle from them (EVDO via Sprint I believe). Now they have removed any online customer account access (can't view usage or billing status, add new credit card, etc. ), so I have to call 'customer service' every time my billing info goes stale. Tjeor so-called 'Customer Service' comes from some Asian country (sounds Indian), and is a struggle to deal with. Terrible VoIP call quality, cacophonous background noise, hard to understand accents, etc. They can't keep my contact and billing info straight, so I'm having to call every month or two when I lose connectivity without warning. -- Just an awful company to deal with now. Won't return email requests for help! Avoid this provider!"